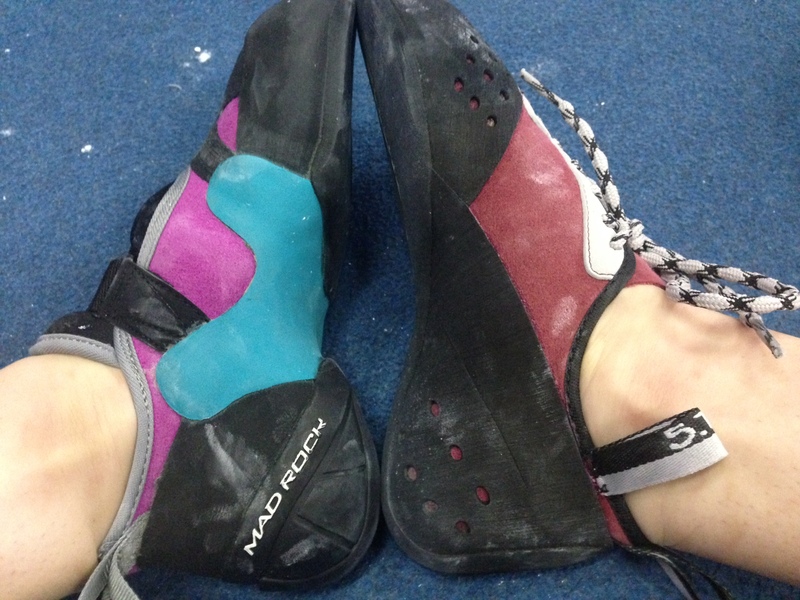 While training for my sport climbing trip to Argentina, I blew through a pair of my beloved 5.10 HiAngles. I was forced to take an older pair of shoes with some tiny tears in the toe on my trip. When I got back home it was definitely time to invest in a new pair! My usual shoe shopping strategy is to buy a pair of shoes that I’ve either worn before or climbed in during a shoe demo. But, this time I decided to do something different. I purchased four different pairs of shoes from four different brands (don’t worry–I purchased them all through companies that offered free shipping so that I could return whatever I didn’t want). Last week when all the shoes had arrived I did some test runs in the gym. Read on to see my side by side shoe reviews! Scarpa Stix $149.00 Vibram XS Grip 2 Microsuede 6.5 oz Slip-on 38.5 (M) too big! For reference, my street shoe size is 8.5 in US women’s, which converts to about a 7 in US men’s. These shoes have been some of my favorites in the past. I love the lace-up system because it makes the sizing very adjustable. You can get your shoes really tight, right where you need it. The toe box is comfortably tight and the heel is well-fitting. One of the best thing about the dragons is how sensitive they are. Thinner rubber on the toes allows you to be able to feel the holds that you’re stepping on. These shoes are pretty downturned but are flexible enough to work well for a variety of angles. For the size I ordered, the shoe was comfortably tight. If you like your shoes to be so tight that you can only bear to wear them for 2 minutes at a time, I would consider buying a 1/2 size down. Some cons of the dragons: the heel tabs tend to break off of the shoe and can rip the rubber around the heel (it’s happened to my friends’ and my own shoes) and the amount of top toe rubber/downturn doesn’t make these the ideal shoe for toe-hooking. However the tight heel box and sticky rubber allows for some of the best heel-hooking around. I’ve never worn a pair of Evolv shoes before, so I didn’t have a great point of comparison for their style of shoes. For the size I ordered (refer to above chart), this was by far the tightest shoe–I definitely wouldn’t down-size from here. These are the stiffest shoes I tried on, and I found it difficult to feel the holds beneath my feet. I felt like my climbing was a little clumsy because of this. 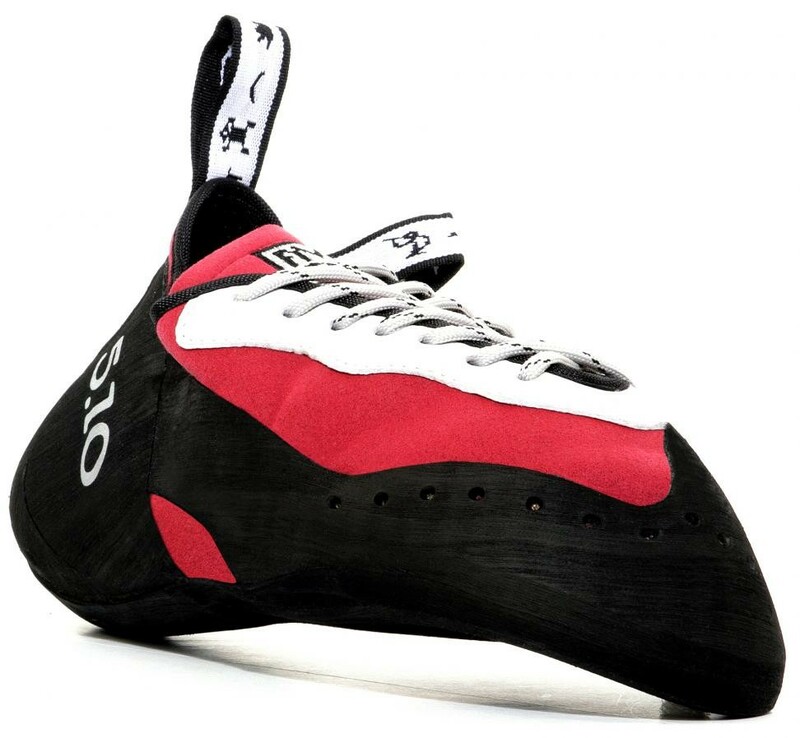 Then again, I’m use to more sensitive shoes, so this might be something that you could adjust to with more practice climbing in them. The stiff, pointed toe would give you an advantage in pushing hard and precisely on small toes, especially on an overhang. The top of the toe box had a lot of rubber for toe hooking, but as these shoes were the most downturned of the four, toe-hooking might be difficult. 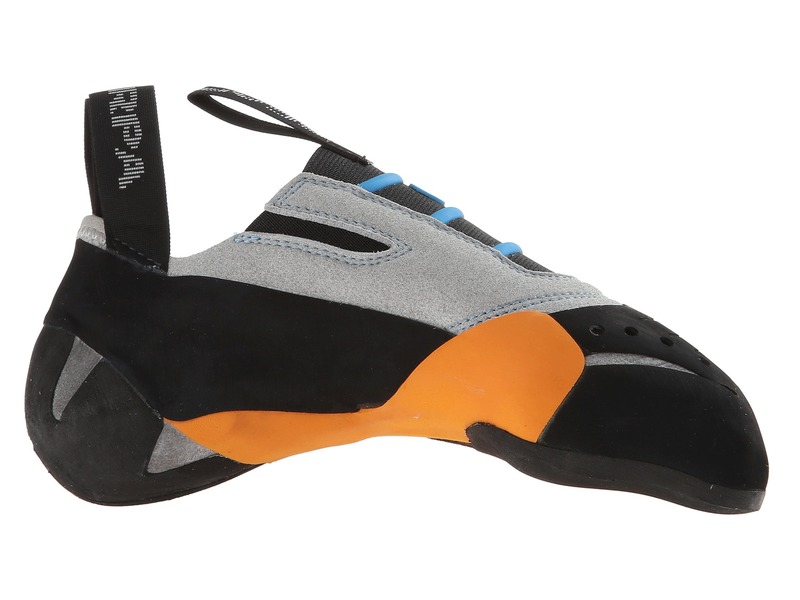 Because of the level of down-turn, these shoes would be excellent for overhang, but I wouldn’t recommend them for slab. The toe box was nice and tight but the heel was looser than I would have liked. The closure system is a single strap, so you need to be sure that the size you get is the one you want, because you won’t be able to make much adjustment. Unfortunately these shoes were just flat out too big. I couldn’t do a great review because of this. So, at least be sure to order smaller than I did. I’ve tried on the Madrock Sharks (their most popular shoe) in the past, but it didn’t quite fit me right. This time I decided to try on the Lotus. It’s a similar style to the Shark but designed for women. My favorite thing about this shoe was the heel–this thing is like a suction cup. It was almost difficult to get the shoe off of my heel because of how perfectly tight it fit. Plus the heel has a ridge on it that makes heel-hooking on small holds possible. 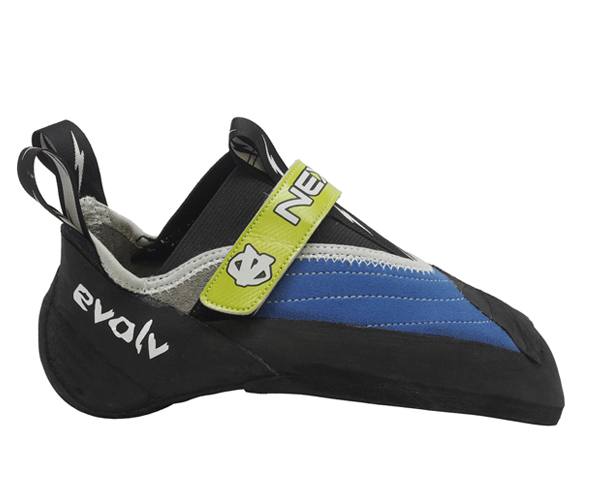 The stiffness of the shoe was a middle ground between the Evolv Nexxos and the 5.10 Dragons. For the sizing, these fit similar to the 5.10 Dragons–comfortably tight. Again, you could downsize if you’re looking for that ultra-tight fit. The strapping system is two-part making them more adjustable than the Nexxos, but less so than the lace-up Dragon’s. These shoes were the only women’s specific shoes that I tried on, and thus had a more narrow fit than the rest. The Madrock arch flex system also makes the body of the shoe more tight fitting and according to the internet helps them to hold their shape (but I haven’t had them long enough to validate that). These are only slightly less downturned than the Dragon’s, making them a pretty well-rounded shoe for a variety of angles, but they don’t give you as much of an advantage on overhang as some of the others. Price: Price is obviously a big factor for many climbers. The shoes here range from about $120-$165. If you only buy 1, maybe 2, pairs of shoes a year then that difference in price isn’t so much if you feel better in one of the more expensive shoes. Plus, you can always look around the internet for deals if price is an important factor for you. Brand Name: To me, this seems like one of the biggest factors people consider in shoe purchasing. Climbers often become comfortable with one brand, and rarely venture away from it. 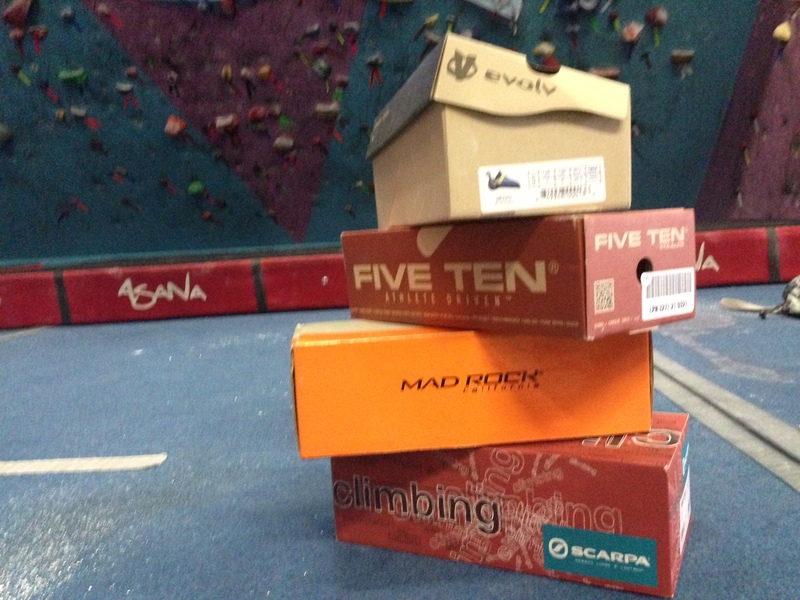 In addition climbers often associate certain stereotypes to each brand. But I think one thing to keep in mind is that there are top-level climbers crushing hard wearing all of these brands. 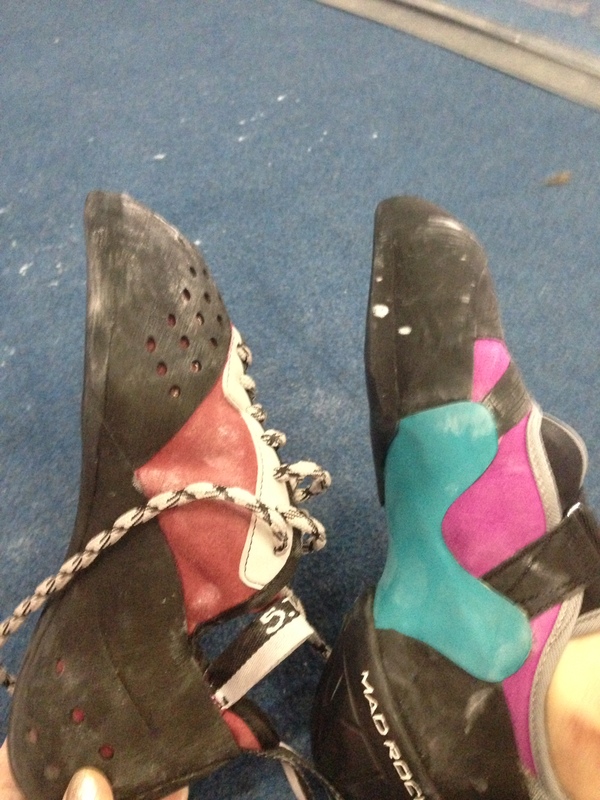 Puccio sent V14 in her Scarpa’s. 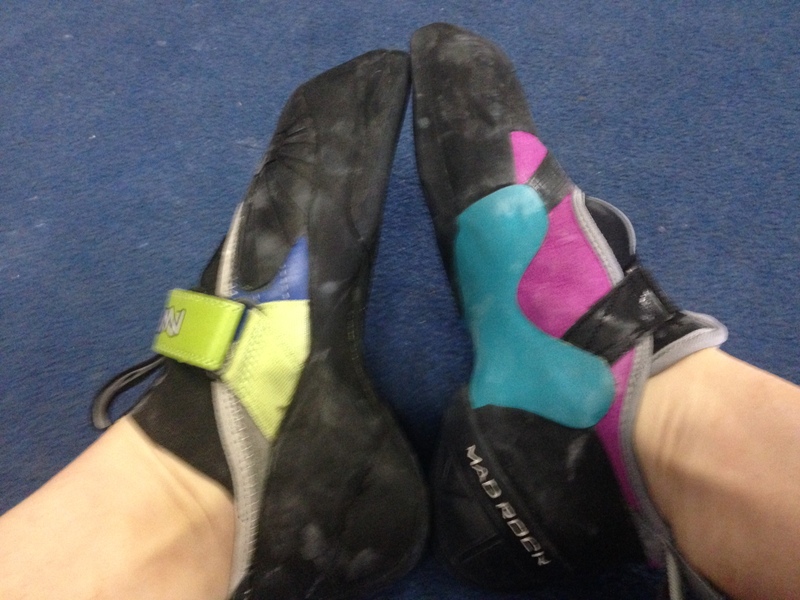 Ashima just completed two 5.15’s in her Evolv’s. 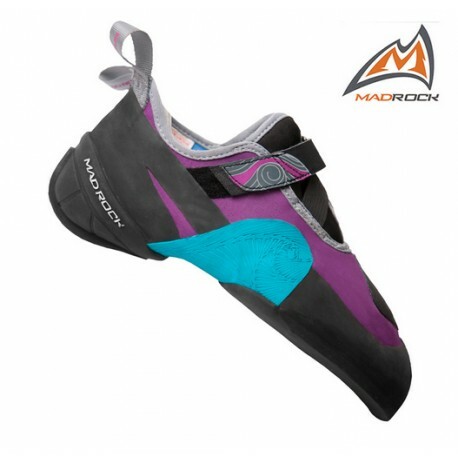 Jule Wurm won the Bouldering World Championships in her MadRock’s. Delaney Miller has been crushing SCS Nationals for the past several years in her 5.10’s. Fit: When I was test-running all these shoes I would climb a route in the Lotuses, then the same route again in the Dragons, and then again in the Nexxos. I would even climb the same route which different shoes on each foot. One thing I couldn’t help but notice is that if I was falling on the problem, I would fall on it in every pair of shoes. And if I was sending, I would send it with every pair of shoes. I’m not saying that shoes aren’t important, but they’re certainly not the most important factor for success. Pick the shoe that fits you best and measures up to what you’re looking for.